We’re on day #4 of blizzard 2016 dig out. There are still so many residential roads that still haven’t been touched. The schools are still closed around here and the federal government is still telling employees to stay home and telework. This is so crazy! There is SO much snow that they really just have nowhere to put it even if they’re plowing. Like, our main roads and interstates have pretty much turned into 1 or 2 lane roads. And there’s like no warning. You’ll be driving and all of a sudden it’s like ‘woah my lane is gone.’ It’s pretty treacherous and I can’t imagine what rush hour is going to be like once everyone starts going back to work. Niiiightmare! In other news, Winston gets his cast off today! He is going to be so happy but he won’t realize that the happiness will be short-lived. He is going to be restricted on so many things that he will think is normal. No jumping, no running, no rough-housing/playing with other dogs, no nothing! We’re going to have to tell ‘no!’ on basically everything he tries to do. This is only the beginning of the long road to recovery. It’s going to be really hard and going to test our (and his) patience so much. But like Jason said, this short-term nuisance will give him a long-term better quality of life. I just wish he understood that :) happy thoughts for the next 16 weeks would be appreciated! During this blizzard, all I have been craving is pure comfort food. The stick to your ribs kind and the not-so-good-for-you kind. It’s the cold weather, I’m tellin’ ya! 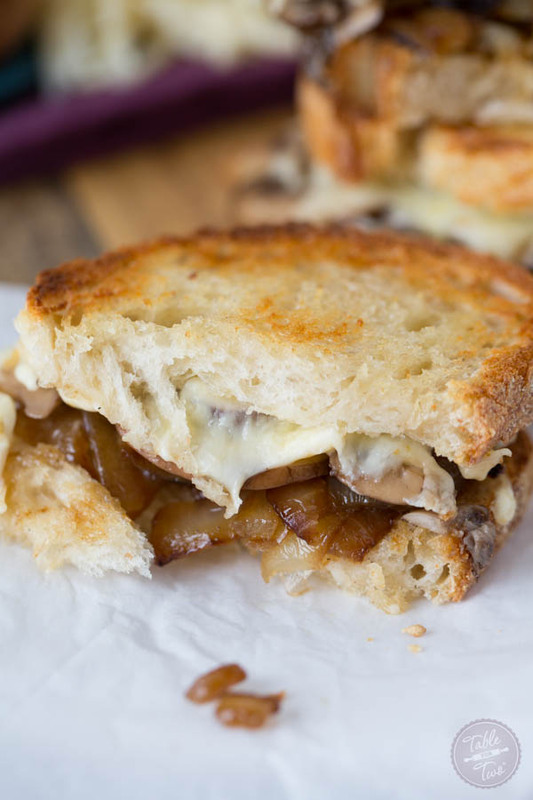 So this caramelized onion, mushroom, and Swiss melt was actually a recipe that was supposed to be in the cookbook! However, I took it out in the end because it didn’t seem very ‘dinner’ and filling for a dinner entree. However, this would be a great lunch option or a delicious dinner with a soup on the side! Omg, yes! An easy sandwich to put together but the flavors will make it seem as if you spent all day making it! In a skillet over medium-high heat, add 2 tsp. of vegetable oil. When oil is hot, add the onions and 1/2 tsp. 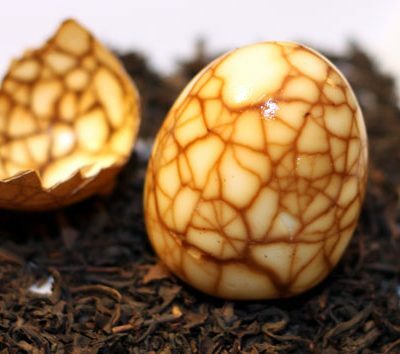 of salt and cook until dark brown in color and softened. Halfway through, you’ll want to turn down the heat to medium heat. Caramelizing onions will take about 20-30 minutes. 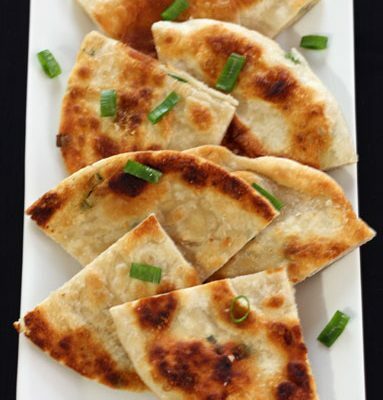 If you notice that your pan is getting slightly dry, adding a tablespoon of water will help the caramelizing along. The water should sizzle and quickly evaporate. You’re not trying to have the water stay in the bottom of the skillet while cooking the onions. When the onions are caramelized, remove from skillet and place in a bowl. Add the remaining 1 tsp. of vegetable oil to the skillet and add the mushrooms and remaining 1/2 tsp. of salt. Cook the mushrooms until softened, about 5 minutes. Remove from skillet; keeping the liquid that has accumulated in the skillet. Take the room temperature butter and butter both sides of bread. Place bread on to a baking sheet and place under broiler for about 1 minute each side. Carefully remove bread from baking sheet and on an even surface, begin to assemble your sandwich. 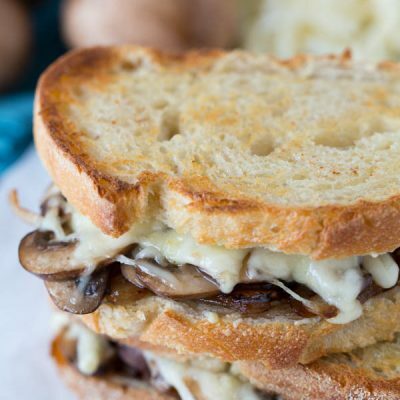 Place caramelized onions on one slice of bread, then the mushrooms on top, then 1/4 cup of shredded Swiss cheese. Gently place on baking sheet. Repeat with another slice of bread. Place baking sheet into the oven and broil for 1-2 minutes until cheese is melted and bubbly. Remove from oven and place the remaining two slices of bread on top of each and gently press down. Slice sandwiches in half and serve! Hooray!! I am so happy Winston gets his cast off today. He will be so happy. Also, this melt makes me very happy!! This wood be great any time of the day! This is totally my kind of sandwich! What a beauty! I think by Day 4 I would be off my rocker with boredom! But this is gorgeous and would totally help!! Not only do I love this combo, but that bread looks delicious! 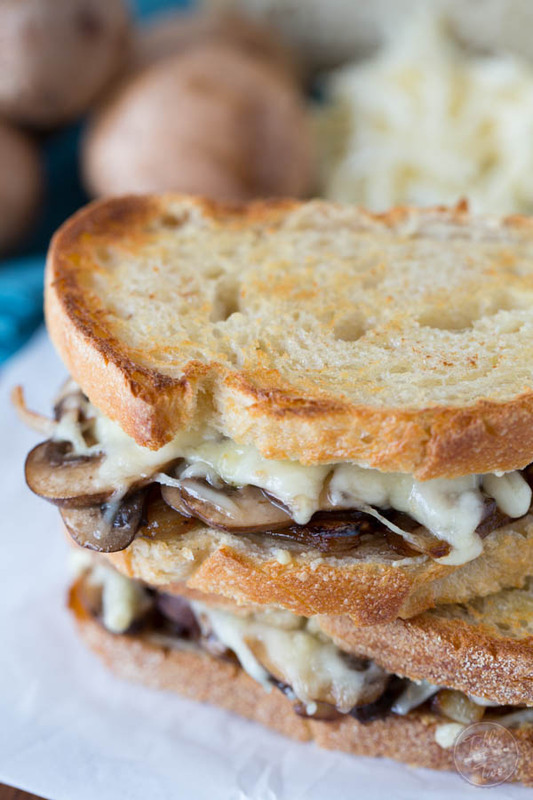 OMG…..Even though it’s 91° I so want to make this…..looks so YUMMO THANK U SO MUCH! It looks delicious and will try this coming week. I am sure everybody will love this sandwich. Sooooo I have never commented on a recipe until now…. but this was seriously *amazing* and may or may not be the best sandwich I’ve ever ate. So simple but sooo good!!! 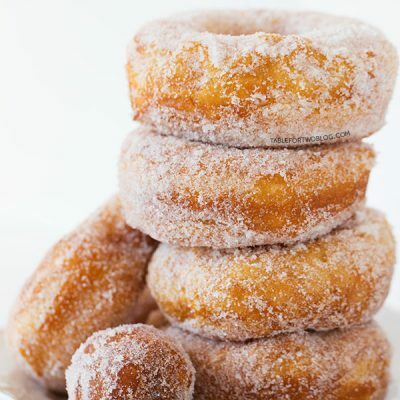 Thanks so much for sharing this fabulous recipe!!! ? Awesome!! Thank you for letting me know! I love this so much I decided to make it a burger…So good! What was the remaining liquid in the pan saved for? Nothing. It’s just worded weird, sorry. Basically leave the excess liquid in the pan from the mushrooms. Oh my! What a heavenly sandwich! We recently went vegetarian and found your recipe and it’s a great go to after a long day. Thanks!!! I made this sandwich and it is delicious !! However you can also add some sour kraute and Russian dressing and you have a Reuben !! True! But you would need the meat!! How can I make this into a slider?how do you suggest toasting the Hawaiian roll? I would just add the ingredients into the middle of the roll then butter both sides and use a heavy object to ‘smash’ down the bread on the stovetop on both sides. 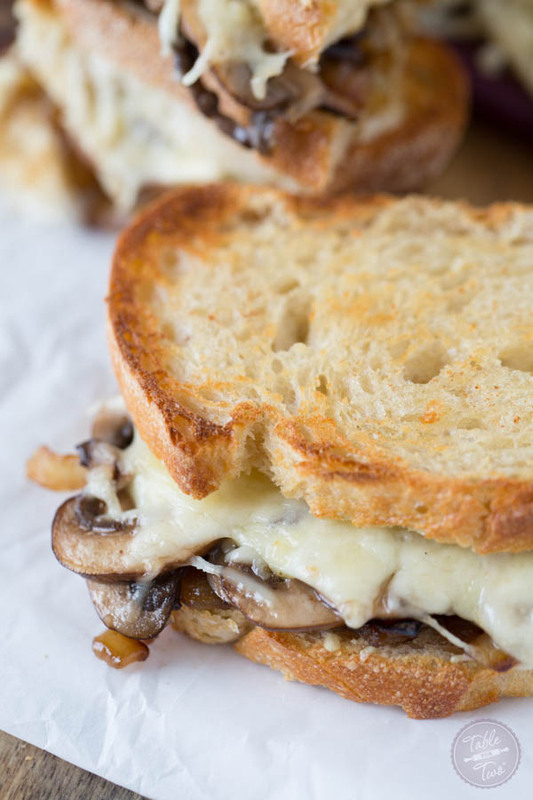 If you are a fan of carmelized onions and sauteed mushrooms, you will love this sandwich. It is so simple to make but oh so good!